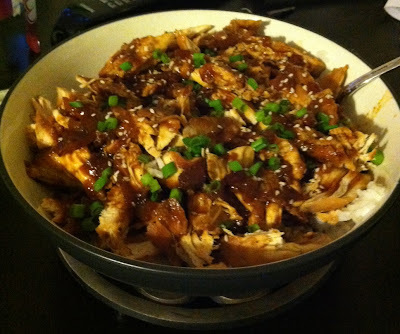 Here's an easy crock pot dish that I got from my niece, Katie, who got it from a blog called The Comfort of Cooking. (I love when people send me recipes!!) She had just made it in her crock pot and told me that "this one is a winner." Works for me! It's quick to prepare, it uses simple ingredients, and seriously, ANYONE can make it. Pretty awesome, huh? You just throw some chicken in, pour the marinade over it, and turn it on! I love recipes like this! And who doesn't love a crock pot recipe? It's perfect for a Sunday when you're running errands or doing laundry, etc. And frankly, I can never say no to Sesame Chicken. It's one of my all time faves!! So give this one a try! You can add some red bell pepper to it, if you like, or just make it as directed. This would also be great to serve with some steamed broccoli. But whatever you do, be sure to include the chopped scallions over the top. Katie said that was the best part!